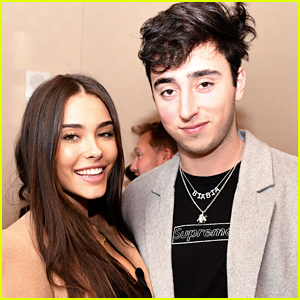 Madison Beer Hides Behind Boyfriend Zack Bia During Date Night | Madison Beer, Zack Bia | Just Jared Jr.
Madison Beer was feeling camera shy while out with boyfriend Zack Bia! The cute couple was spotted leaving The Nice Guy on Friday night (January 25) in Los Angeles. Madison looked super chic in a tight black dress paired with knee high boots. On the way out of the hot spot, Madison was all smiles but tried to avoid the cameras by hiding behind Zack! The couple shared a laugh before continuing on their way to their car. Madison Beer Kisses Zack Bia at Midnight on NYE! Madison Beer & Zack Bia Hold Hands on Date Night! Madison Beer Joins Boyfriend Zack Bia For Lunch Date! Madison Beer Releases 'Home With You' Remixes - Listen Now! Madison Beer Releases 'Home With You' Music Video - Watch Here!